Another respected forecasting group has slashed construction growth predictions for 2019 amid Brexit uncertainty and falling commercial orders. 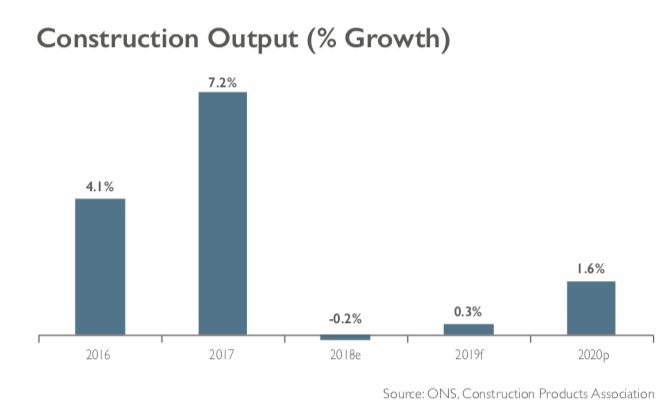 Just six months ago, the Construction Products Association forecast 2019 construction output would rise by 2.3%. This was revised to 0.6% three months ago and now been cut in half again to just 0.3%. The latest CPA forecast follows Experian, which last week also predicted a weak 0.4% rise in activity this year, after downgrading its outlook for construction. Economists at the CPA have also revised last year’s expected output figure from flat growth of 0.1% down to a contraction of 0.2%, ending the industry’s long run of annual growth in activity. Civil engineers are best placed to ride out the uncertainty with strong growth forecast for infrastructure which will hit its highest output level on record this year. But even here there is some concerns about long-term workloads after the cancellation of two major nuclear power stations. Major building contractors face even worsening outlooks as Brexit uncertainty continues to drive expectations for the sharpest construction decline in the commercial sector, particularly felt in the offices sub-sector. Investors have signalled the uncertainty is too high to justify significant up-front investment, and output is expected to fall 20% this year. Conversely, Brexit-related prepartions are helping harbours workloads which are expected to grow by 12% in 2019 and 10% in 2020, and could be higher if works on improvements and expansions of ports need to be carried out. If there are major issues around Brexit, warehousing will be another sector that benefits from increased activity due to demand for storage and stockpiling facilities. Following growth of 20% in 2018, construction activity in this sector is forecast to rise a further 10% in 2019 and 2020. Noble Francis, Economics Director at the Construction Products Association, said: “Fortunes for construction depend greatly on which sector firms are operating in. “Our latest construction forecasts are conditional on either a revised Brexit Withdrawal being agreed with the EU and getting through UK Parliament or a delay to Article 50. 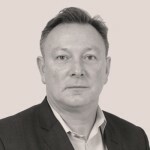 “However, even if this occurs, the uncertainty surrounding Brexit is clearly affecting the construction industry in areas that require high investment up front for a long term rate of return such as commercial offices. “The construction of prime residential apartments and industrial factories is also being affected greatly by the high and rising Brexit uncertainty,” he warned. He added: “The forecast growth in infrastructure is due to main work on major projects such as Hinkley Point C, the first new nuclear power station in over 20 years. “However, government inability to deliver major projects to time and budget remains a major concern, highlighted most recently by the stalling of work on the second of the new nuclear power stations Wylfa Newydd and the cancellation of Moorside, the third new nuclear power station.